We were proud to sponsor Global Poverty Project for the launch at St Paul’s Cathedral to churches across the UK. They had an audience of 800 which we think is a wonderful achievement. Well done! They were joined by the Secretary of State for International Development Douglas Alexander, the Archbishop of York John Setanmu and TV presenter Denise Robertson. 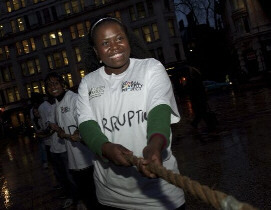 Here they are wearing their Fairtrade T shirts and taking part in the Global Poverty Project “Tug of War”.